Trudi Ross is an actor, Comedian and MC. She classically trained as an actor in London that lead her to Stand-Up Comedy. She has since worked in Theatre, film, Voice Over, Corporate, Stand-up in both London and Australia. She hosts weekly Comedy Trivia nights in Sydney and MC’s weddings and corporate events. Most recently she has opened a musical theatre show “Meet the Transylvanians” touring RSL’s clubs around Sydney & NSW. Trudi worked as an artist for the Arts Health Institute as a Humor therapist working with people living with Dementia, MS and Parkinson’s in the aged Care sector. She has previously work with Director Chris Sun in his feature Film Charlie’s Farm playing the role of Meredith along side Bill Moseley and appeared in his 2018 Universal Pictures release of Boar, with Aussie legends Ernie Dingo and John Jarratt. Frida performed in her first solo stand up show at the Sydney Fringe 2016 and toured with the annual comedy hit show, A Very Woggy Xmas Gala. 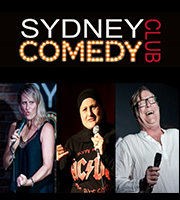 Frida breaks down any preconceptions with her explosive comedy in regular appearances in comedy clubs around Sydney and the USA. It was 1983 when Alan Glover started his standup career at Sydney’s Comedy Store. Since then he’s appeared at London’s Comedy Store among many UK venues, San Francisco’s Punchlines amid multiple US clubs, plus Ireland, Singapore, and Canada. He’s toured The Netherlands, New Zealand, and of course Australia where he’s performed in every state, every capital city, most regional centres, and the waters of Australia & the South Pacific. Alan loves festivals and has performed at Melbourne International Comedy Festival, Sydney Comedy Festival, The World’s Funniest Island, Woodford Folk Festival, Canberra’s National, Port Fairy, Cobargo, Yackandandah, Illawarra, and the infamous Nimbin MardiGrass.